The online version of this article ( https://doi.org/10.1186/s40425-019-0548-6) contains supplementary material, which is available to authorized users. HER2 is overexpressed in 15–20% of breast cancers (BC) and is associated with clinically aggressive disease . Targeting this oncogene has led to striking improvements in survival outcomes for HER2+ BC patients. 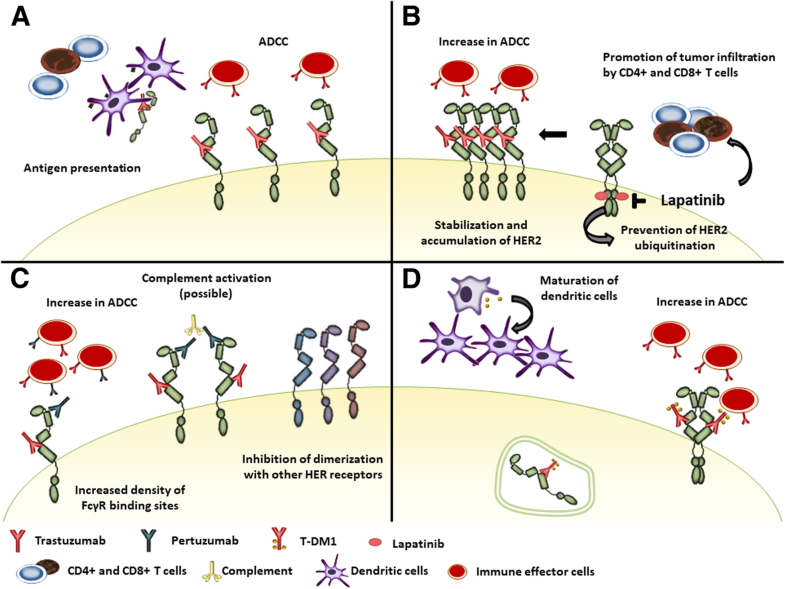 To date, several HER2-targeted treatments are available, including monoclonal antibodies (trastuzumab, pertuzumab), tyrosine kinase inhibitors (lapatinib, neratinib), and antibody–drug conjugates (Ado-trastuzumab emtansine [T-DM1]) [2, 3, 4, 5, 6]. To date, most data regarding the clinical validity of pre-existing immune response in HER2+ BC come from patients treated with trastuzumab-based chemotherapy for early BC (Additional file 1: Table S1 and Table S2). 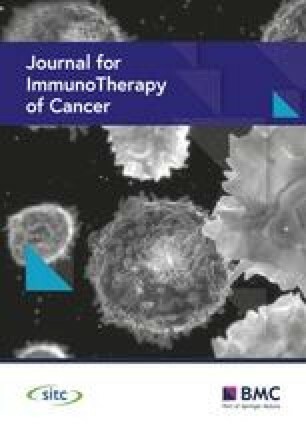 From a prognostic perspective, several studies in HER2+ BC patients receiving neoadjuvant (Table 1) or adjuvant [7, 24, 27, 28, 29, 30] anti-HER2-based chemotherapy have shown that expression of immune-associated gene signatures and infiltration by TILs in pre-treatment biopsies associated with longer DFS , independently of known prognostic clinical-pathological variables. Lapatinib has been tested in various clinical settings, either alone or in combination with chemotherapy, trastuzumab or hormonotherapy. Recently, a metanalysis of five neoadjuvant trials reported the impact of TILs in HER2+ BC treated with chemotherapy plus trastuzumab, lapatinib or their combination . Four trials used a combined regimen of anthracyclines and taxanes (CherLOB, GeparQuattro, GeparQuinto and GeparSixto [55, 56, 57]), while paclitaxel alone was administered in the NeoALTTO trial . In patients receiving anthracyclines and taxanes, high baseline TILs were significantly associated with pCR, irrespective of the anti-HER2 treatment received (interaction p = 0.077). In the NeoALTTO trial, the relationship between TILs and pCR was nonlinear and rates of pCR increased sharply for TIL levels greater than 5% (p = 0.01), regardless of treatment group (interaction p = 0.519) . However, the relationship between TILs and DFS was linear, regardless of treatment group, and patients with high TILs at baseline had better outcomes independently of whether they achieved pCR. Authors suggested anthracyclines given after surgery might explain the linear relationship with event-free survival. A first strategy is to optimize ADCC. 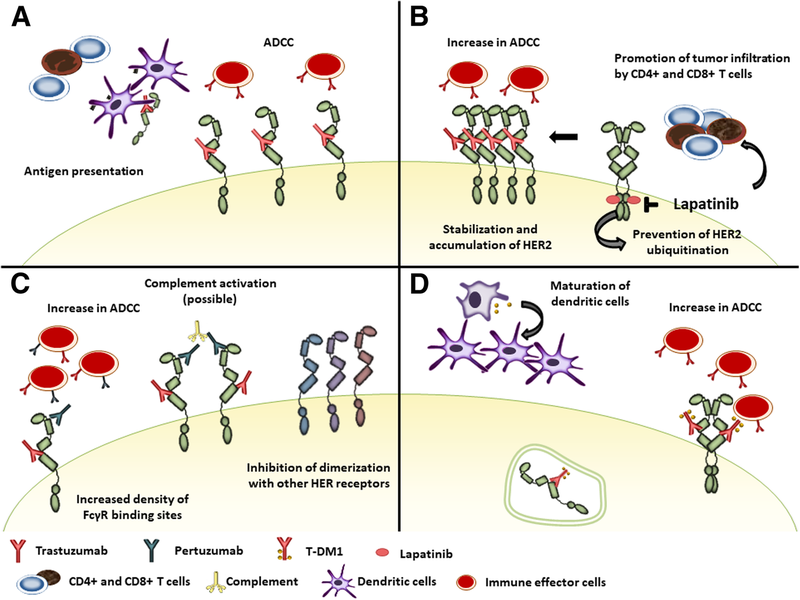 The interaction between the IgG Fc and the FcγR on an effector cell is the first step leading to immune cell activation and some common single-nucleotide polymorphisms (SNPs) in FcγR genes have been associated with different antibody-binding affinities. Even if reported associations of SNPs with response to trastuzumab are discordant [91, 92, 93], attempts have been made to enhance antitumor activity through the design of anti-HER2 antibodies engineered for increased affinity for these SNPs. Margetuximab (MGAH22) is a monoclonal antibody which binds the same epitope of HER2 as trastuzumab, with similar affinities and the same anti-proliferative activity. It carries five aminoacid substitutions in the Fc domain to increase binding to low affinity isoforms of FcγR and reduce binding to CD32B, an inhibitory FccR, resulting in superior engagement of effector cells . Phase I trial testing margetuximab single agent in HER2-overexpressing solid tumors reported meaningful clinical activity . Recently, a press release reported that the phase III trial, comparing the addition to chemotherapy of margetuximab vs trastuzumab in HER2+ mBC patients with progression on prior HER2-targeted treatment, demonstrated a 24% risk reduction in PFS with margetuximab as compared to trastuzumab. However, complete data is still awaited (NCT02492711).